← Are You Feeling Under the Weather? 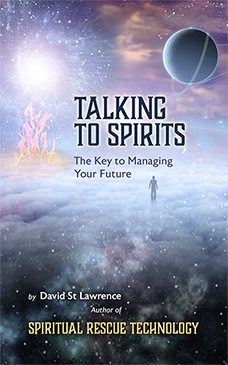 “Talking To Spirits” – Look for my new book in October! This book was a natural outgrowth of the Spiritual Rescue Technology I developed for use use in spiritual counseling during the past decade. I wanted to create a work that would undercut all of the technical discussions about spirit behavior and the mechanics of spiritual influence and possession and would give a new person an entry point into the spiritual universe through caring conversations with spirits of all types. In its current form, it is a handbook on how to make friends with spirits and get them to assist you in making life easier. I have included excerpts from actual sessions so you can see that spiritual communication can create major changes in a person’s awareness and personality. It is my hope that this will serve as a guide to developing an effective relationship with your spiritual companions which allows you to accomplish goals that are otherwise inaccessible. Here is a preview of my “Talking to Spirits” Seminar at the Floyd Library on 2-25-17. A full length version of this talk has been posted on Vimeo. This entry was posted in Talking to Spirits. Bookmark the permalink.